Apple-Twitter Deal: Just a Rumor? What happens when two super-hyped tech companies collide in the rumor mill? You get a Tweetintosh. That's right folks, the rumor mongers are saying that Apple is in late stage talks to acquire Twitter for as much as $700 million. The Mac maker is reportedly hoping to have a deal in place with Twitter by June 8 in time for Apple's Worldwide Developer's Conference in San Francisco. 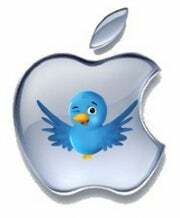 Apple + Twitter = ???? While an Apple acquisition of Twitter may sound interesting, it doesn't make sense to me. It's true that Apple has a habit of snapping up smaller, successful companies; however, Apple also has a habit of buying companies that complement its strengths. Last summer, for example, Apple bought computer chip maker P.A. Semi and has been recently hiring chip-making talent from other companies. The reasoning behind the computer chip push is for Apple to achieve greater control over all aspects of its product line, and to ramp up the gaming abilities of the iPhone and iPod Touch. Chip-making and gaming may be a daring move for Apple, but these ideas still make sense since they enhance Apple's core businesses: Mac computers, iPods and the iTunes Store, and the iPhone. Twitter, on the other hand, is a Web-based business that does not fall within any of Apple's three main businesses, and Twitter has no known business plan to make money. Some are suggesting that Apple wants to acquire Twitter so that it can learn about Web development from the hottest Web property du jour. But have you looked at Twitter's Web site lately? I've seen Wordpress blogs with more innovative designs. Of course, Twitter's appeal is its real-time search engine and instantaneous communications, but reliability has often been a problem for Twitter, and Apple has already mastered its own version of the fail whale with last year's Mobile Me debacle. Sorry, folks, but Twitter has rejected offers from Facebook and possibly Google. Those two companies were in a position to use Twitter to enhance their businesses and even make some money off of the microblogging company. Apple, by comparison, has no clear motive to buy Twitter, and no possible use for Twitter under Apple's current business plan. Like any other Apple rumor, the company's acquisitions have a tendency to venture into the ridiculous. Take, for example, another rumor out today that Apple might buy videogame maker Electronic Arts. I don't believe this rumor either, but considering Apple's recent interest in computer chips and gaming, an EA acquisition makes far more sense than a Twitter purchase.